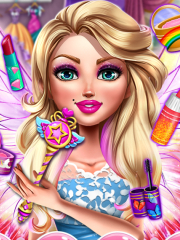 Fairy Tale Makeover is a fun game for girls to play online or on mobile phone. Our beautiful fairy is very eager to try on a new look. With your help she will find the perfect makeup and hair style. The next step is choosing a new pair of wings and a fabulous outfit. You will also have to decorate her room. After the makeover is complete the fairy will be ready to amaze her friends. Have fun!